Do you need a simple calculator which allows you to do basic mathematical operations? Or perhaps you are more demanding user and need to calculate trigonometric functions or logarithms? Do you prefer to calculate complete algebraic expressions... or maybe you are a fan of Reverse Polish Notation (RPN)? Would you like to have a calculator which looks like 'real' on the screen of your smartphone? All of this and much more is offered by PG Calculator - the only calculator you will ever need. PG Calculator is an application that turns your smartphone or tablet into a powerful scientific calculator with nice and simple user interface. In algebraic mode you can enter the entire math expressions such as (2+3)*(4-1) or sin(Pi/3)+cos(Pi/6). It then gives you the correct result according to the conventional mathematical operators. 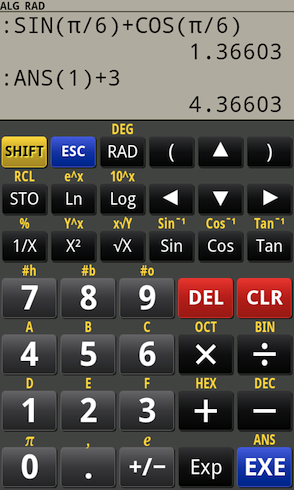 In RPN (Reverse Polish Notation) mode you first input your numbers and then tell calculator what to do with them. So for example if you want to calculate (3+4)*5 you simply type as follows: 3 ENTER 4 ENTER + 5 ENTER *. The ENTER key places the number on stack and the operator keys do the task on the numbers. NOTE: This version of the application is free. It displays ads but has the same functionality as the 'PG Calculator (Standard)' edition. There are totally 5 version(s) of PG Calculator for Android on this site. More details and all its versions are available on the PG Calculator for Android portal.